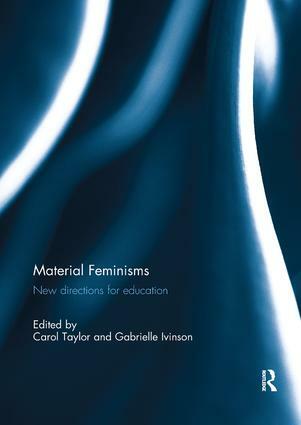 Material Feminisms: New Directions for Education provides a range of powerful theoretical and innovative methodological examples to illuminate how new material feminism can be put to work in education to open up new avenues of research design and practice. It poses challenging questions about the nature of knowledge production, the role of the researcher, and the critical endeavour arising from inter- and post-disciplinarity. Working with diffractive methodologies and new materialist ecological epistemologies, the book offers resources for hope which widen the scope for how educational problems are interrogated, and provides a political counter-movement to neo-positivist, outcomes-based approaches within education. Inspired by writers such as Barad, Bennett, and Deleuze and Guattari, the book makes a radical break with cognitive, dualist, and universal conceptions of human subjectivity and intelligence in education. By taking its starting point as the co-consitutiveness of discourse, materiality, corporeality, and place, the book foregrounds educational practices as material enactments of multiple, non-linear, entangled, affective, and relational forces. It offers new insights into how gender, class, and ethnicity are constituted in, and by, material assemblages that are often submerged or ‘unseen’. This book is an essential starting place for those intrigued by what new theoretical accounts of materiality, posthumanism, and affect can offer educational research. Diffractive methodologies challenge readers to take a fuller range of actors into account than in ‘objective’ humanist methodologies, and in so doing to pay closer attention to what data is. It invites researchers to engage with long-standing feminist concerns about power and knowledge production in research processes. This book was originally published as a special issue of Gender and Education.